[SatNews] Another positive indicator regarding the health of the satellite operators. 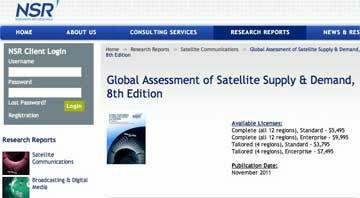 NSR's Global Assessment of Satellite Supply & Demand, 8th Edition study, released today, indicates that satellite operators continue to buck the global economic malaise. In 2010 global satellite operators saw a strong revenue increase of over US$550 million, derived from the lease of commercial satellite capacity. NSR projects that by 2020 capacity leasing revenues will reach US$17.2 billion, up from US$10.1 billion in 2010. 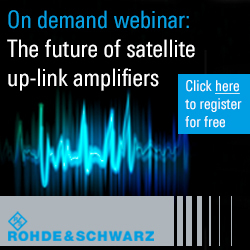 "While growing transponder demand and increased pricing are certainly good news for satellite operators, broadcasters and end users are taking advantage of new technology to get more utility and revenue from each leased MHz," notes Patrick M. French, Senior Analyst for NSR and report author. "Maintaining this critical value proposition will drive the addition of over 17,000 SD, 5,000 HD and 200 3D channels for carriage on the world's DTH and distribution platforms, along with other development, in the coming ten years," French adds. Combining commercial C-, Ku- and widebeam Ka-band transponder demand, NSR estimates over 5,480 TPEs of capacity was leased on the global market in 2010, and will increase at an average annual rate of 2.3 percent through 2020 to well over 6,900 TPEs. DTH and video distribution drives new transponder demand, followed by VSAT networking and commercial mobility services. Further, NSR projects that worldwide High Throughput Satellite (HTS) capacity demand will increase by over 620 Gbps in the coming ten years. The most important point to make about the global HTS market is that the majority of the demand expansion is developing in truly new areas and not at the cost of other parts of the traditional satellite market. In short, the emerging HTS services are most important in terms of how they expand the overall size of the global satellite market.